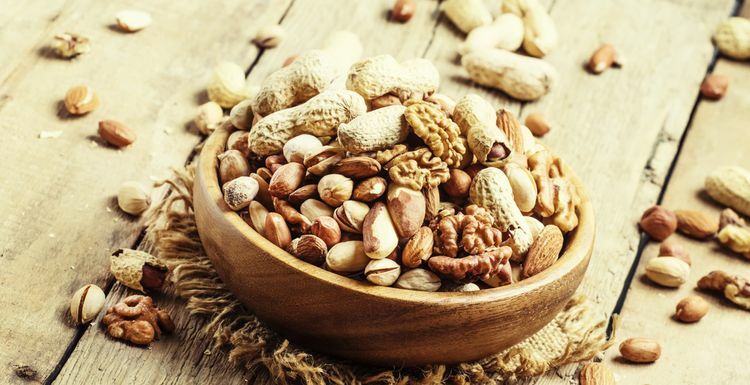 We’ve long known the benefit of nuts for our skin and hair, and that they offer a healthy protein hit during workouts. Did you know they can also prevent a whole range of disease? Just one handful of nuts each day (20g) has shown to be beneficial in cutting down diseases including cancer, stroke and other heart disease. The same amount has been shown to cut the risk of dying from respiratory disease by half. Dying from diabetes has shown to be 40% lower by eating 20g nuts each day. High in fibre, magnesium and polyunsaturated fats which can reduce cholesterol levels, nuts are great all-rounders. High in protein, nuts have been shown to reduce obesity over time. Both peanuts and nuts (which are actually legumes) are equally as beneficial. One handful is the optimal amount, as more than this was not shown to have any more benefit. Full of energy, nuts can see you boost your energy levels easily without reaching for the chocolate. So with all these benefits from nuts, get nutty and sprinkle on your porridge, take as a snack, or add to your cuisine for a healthier lifestyle! I have been eating chocolate brazil nuts over Christmas. Delicious! And I still feel relatively healthy eating them.